Update: This product has been listed as unavailable for a while now. There are some solid alternatives, including the MiraFit VKR – which covers everything that the Gym Master did at a great price. You can check out the pictures and solid user feedback via this amazon.co.uk product page. I will keep an eye on the Gym Master page, and refresh things if they do bring it back. Summary: The 2016 edition power tower offers the perfect home workout. Working a great range of muscles through pull-ups, dips and many other exercises, this reasonably priced power tower is sure to get you ripped. 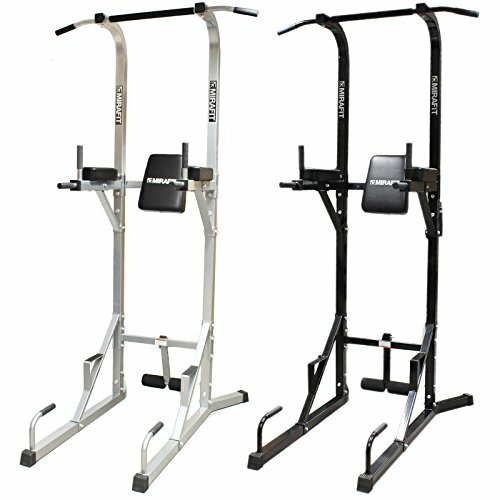 The Multi Power Tower is an ideal piece of equipment for multiple workouts in the comfort of your own home or garage. With a welded steel frame, this item is both compact and sturdy and is ideal for working your arms, abs, chest and back. Currently on sale at Amazon with a huge discount, this item is now in the low cost category, offering great value for money. Using this power tower you’ll be able to work a large amount of muscle groups through pull-ups, chin-ups, pushups and dips. With ergonomic hand grips you’ll find reduced wrist strain while thick cushions will provide both firm support and protection to your back and arms. Though tall in size, this equipment won’t take up too much room, the floor dimensions being just 110 x 113cm, while an overall weight of just 18kg makes it easily portable too. There are a number of similar items in approximately the same price range, some even a little cheaper; however the added sturdiness of this item certainly makes it a reasonably priced one. The design of this item is particularly good too, with all of the ‘stations’ on one side, meaning it can be placed against a wall, saving space over other power towers. Reviews of the item are overwhelmingly positive. Many users have stated how solid and sturdy the tower is, while also stating how they think its great value for money. The equipment is said to be straightforward to put together but there was an almost unanimous recommendation not to tighten all of the screws fully until the assembly is complete. For great variety when it comes to your workout, the 2016 edition of the Gym Master Power Tower is an ideal piece of equipment. Compact, but solid, it’s a real space saver and makes for a perfect addition to a home gym. Check it out now at amazon.co.uk, and see if the big discount is still in place! Updated Link: This product has been unavailable for some time. Check out this Power Tower from MiraFit for a solid replacement.